I was sent a coupon for a free jar of the Simply Ground Peanut Butter by Peter Pan a few weeks ago. I literally had to tell my son not to eat it right out of the jar until I made these cookies then he could have all he wanted! It cost $3.49 at our local WD but I found the honey roasted on sale today at Hellmart (ie: Walmart) for $1.98. We always buy the natural versions of peanut butter whether it’s Jif or Peter Pan but they never last long cause my son loves it so much and could live off of it if he had too. It is a peanut butter with some texture to it so if you love only creamy this might not be for you but we love both creamy and crunchy so we loved it the in the middle consistency. Okay now for the recipe. I got this recipe from Mommy’s Home Cooking and she makes the cutest ghosts for Halloween with it. I am not that talented so we stuck with my simple Gingerdead cookie cutter. I printed it out on back to school paper cause I figure Back to School/Fall/Halloween kind of go hand in hand right….No just me…alrighty then. Here is a little video I made of me baking the cookies. And here is the finished product. I think the “tanner” Gingerdeads were my favorite cause it really brought out their faces more, but my son likes his cookies on the light side ya know almost like they are not even cooked. LOL I also made the traditional peanut butter cookies with any left over dough. One Gingerdead man broke so of course I had to do quality control and OMG they are super yummy and would be even better with that yummy icing Mommy’s Home Cooking put on hers. So if you are in the market for some new peanut butter I would definitely give this one a shot! These are my “Mindy” trees (ie Crepe Myrtles). They used to be in between mine and my best friends yard growing up, but the county had to do some work several years ago and dug them up. My brother managed to save quite a few and now they are planted in my yard, my neighbors yard and my parents yards. They have bloomed so beautifully this year!! I was playing around in lightroom with them so here are the before & after's. If you are the praying type please say a prayer for my friend Melissa and her family and if you are not the praying type please send positive thoughts. Matilda was my helper opening this months Ipsy bag! The bag was created by Ipsy’s founder Michelle Phan. It’s concept was to inspire the beautiful dreamer in all of us. It’s pretty cute right?? My camera was making this look more peach but it is more pink. Organic Surge Daily Care Perfecting Face Polish. I have not tried this yet but from the reviews on their site I think I will like it. Full size retails for $7.63. All in all I think this was a pretty darn good bag this month. I buy this $10 subscription with my own money. If you want to click the link in the sidebar to join I get points. Also if you see a code in parenthesis that means they are giving a percentage off on their site. Thanks for stopping by!! I saw this recipe the other day on Get In My Belly’s FB page and it is so easy but delicious!! Set your oven at 400 degrees and lightly coat a baking dish with pam or whatever you use. I use olive oil spray. Then it is literally a layering game. 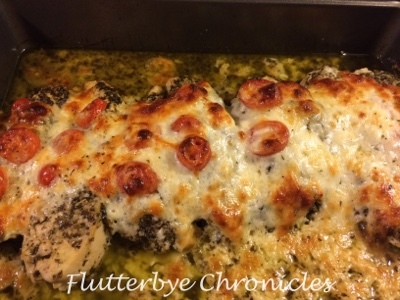 Lay the chicken in the pan, spread basil pesto on top of each tender, then put tomatoes on top of that, Sprinkle top of tomatoes with salt and pepper, then layer on the mozzarella, then sprinkle all of it with shredded parm and italian seasoning. 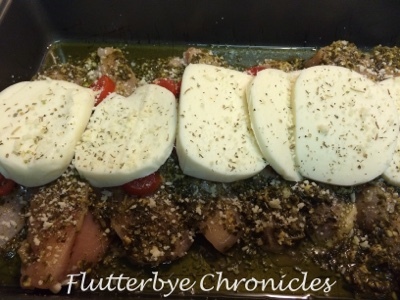 Pop it in the oven for 40 minutes and voila the perfect chicken to serve with garlic bread, pasta, or to place on top of a salad. Just a couple items I used up this past month. Whish Bath & Body gel in pomegranate. I really liked the smell of this one but there was so little in the sample it was hard to get a feel for if I loved it or not. I doubt I will repurchase. Hand Food by Soap & Glory in the scent Smoothie Star from their holiday collection from last year. OMG this stuff smells like sugar cookies and I am sad it is my last one in this scent. Hopefully they bring it back this holiday season. Crabtree & Evelyn Rosewater ultra moisturizing hand therapy. This stuff is amazing and smells amazing. I usually can find it at TJ Maxx or Marshalls for really cheap. Milani Moisture Lock Coconut Infused Lip Treatment in repairing primrose. When I bought this I did not have high hopes but I really liked it a lot. My only beef with it is there is not much product in it. I literally went thru it in two weeks. I also have it in conditioning grapeseed which I also like. Will definitely repurchase. Buxon Show Me Some Skin weightless foundation. This works nice when applied with a beauty blender type sponge at first but then it starts creeping into every nook and cranny on your face so I am gonna have to say pass. Urban Decay Naked Skin One & Done. I absolutely love this. I got a pretty good sample from Sephora and used it for about a week. As soon as I run out of some of my other foundations I am going to buy a full size. Philosophy Take A Deep Breath Cushion Foundation. In all honesty I have no clue if I like this cause there was hardly even enough in the sample to try. YSL Fusion Ink Foundation. This was really nice and evened out my skin and made it super soft but since it is so expensive I doubt I will ever buy it. bareMinerals Bareskin Pure Brightening Serum Foundation. This had a nice semi matte finish and smoothed out my skin nicely. Plus it really does give your skin a brighter I slept like a baby effect which I kinda love. I would definitely consider purchasing this when I run out of other foundations.